There are few neighborhoods in the world as recognizable and iconic and Manhattan’s Financial District. Home to the NYSE, Wall Street, and the Federal Reserve Bank, the Financial District in New York City serves as the financial capital of the world. Add attractions like the South Street Seaport and One World Trade Center in with some incredible New York restaurants like Shake Shack and Ramen Co., and it’s no wonder this area is so well known. With so many residents and businesses in the area, the demand for affordable moving and self-storage services is bigger than the skyscrapers that occupy the Financial District’s streets! Enter Zippy Shell, the company with the fastest, cheapest, and most efficient moving and storage in Manhattan. Mobile Storage in the Financial District! In a city like New York where traffic is a constant problem, a mobile storage unit can provide the perfect solution to those trying to organize self-storage or a move of any kind. The Zippy Shell process is the simplest and most convenient that Manhattan has to offer. We deliver a mobile storage container unit and pick it up once it’s ready and loaded. It’s that simple! Zippy Shell’s unique service can help you shift your clutter with one quick call. With our help, you’ll be able to move into that high-rise or de-clutter that cramped office quickly and painlessly. The Financial District’s Easiest Option For Moving and Portable Storage! Whether you’re moving a business or home into or out of the Financial District, portable storage units are by far the easiest way to manage your move at your own pace. Moving trucks are simply not a viable option with the downtown hustle and bustle. Have you ever tried to load a moving truck while neighbors come and go from their homes? Constantly moving the truck while you’re trying to pack it not only takes forever, but also can cost a fortune. Portable Storage for Businesses - Parked on the Street! Because Zippy Shell’s portable storage containers are ideal for businesses looking for a mobile self storage solution. That&apos;s becuase our portable storage units are street legal trailers! That means we can pull up right in front of your business to let you load your belongings. This means that even amongst the crowds of tourists coming to visit the famous Charging Bull statue, we can deliver a Zippy Shell right to your business. Once you or our team of experts loads your portable storage container, our driver takes it to a secure, climate-controlled storage facility. There, you can rest easy knowing that your belongings are being kept clean and safe, ready to be redelivered whenever you need them - wherever you need them... we even do long distance moves! How simple is that? Most Affordable Moving and Storage in The Financial District! 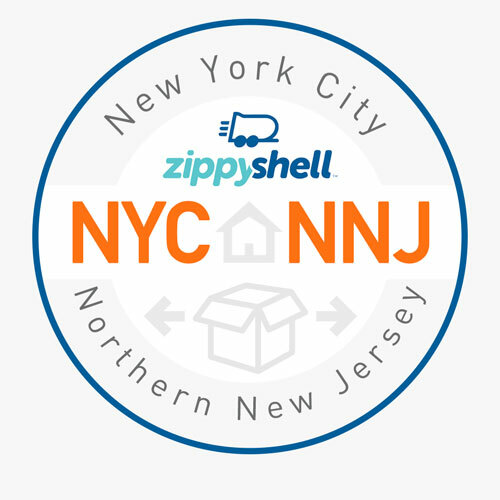 Zippy Shell of New York City and Northern New Jersey simply provide the Financial District and all other New York City neighborhoods with the best deal in moving and storage. Contact Zippy Shell today to find out how little it costs and to experience our truly unique portable storage and moving services!